Attends adult diapers can provide security to incontinence sufferers. As a caregiver you want to find products that are convenient to you and will provide your loved one with plenty of protection against incontinence. Attends adult diapers can provide security to people of all ages who suffer from incontinence. When people think about incontinence, their minds usually turn to the image of an old man or woman who cannot take care of himself or herself. However, incontinence is a disease that can affect anyone at any age. Small children, after they are potty trained, are just as susceptible to incontinence as anyone else. Because incontinence is a medical condition, it is important to talk to your doctor about any issues that you might be having before you decide to invest in Attends diapers or any other brand of incontinence products. However, if the issues you seem to be having are with the incontinence of another person, then there are a few things that you should do. When you are looking out for someone that you care about, you want to make sure that that person is able to take care of themselves. But sometimes things come up where the people you care about are unable to care for themselves and you are put in the position to take care of them. This is often the case with men and women who are taking care of their parents in old age. If your mother or father suffers from incontinence, then Attends adult diapers are the way to go. Attends adult diapers are specially designed to provide an added measure of protection to the undergarments. They are very useful for people who are not always able to make it to the bathroom in time. If this sounds like someone that you are taking care of, then you owe it to the both of you to invest in some Attends adult diapers. Attends diapers are often worn to protect, but sometimes people are hesitant to the idea of wearing diapers at all. When you are taking care of someone who suffers from incontinence, you need to make sure that person understands that you care about them. Suggesting to a mother or father that they should wear Attends diapers may be a bit of a touchy subject at first, but the conversation must be had. It is a situation that you need to approach delicately in order not to offend them and to make them feel comfortable. 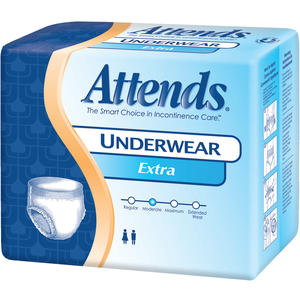 Buy a sample packet of different Attends adult diapers to help you find a product that fits your loved one properly. The diaper should be snug but should not rub against their skin, causing painful rashes. The product should also provide plenty of absorption for your loved ones so you don’t end up with leakage and other concerns. Attends diapers are not just for adults. There are also diapers made for younger individuals, specifically children that may suffer from incontinence. While most children are able to control their bladders by the time they make it to grade school, some children are not so lucky and they have a difficult time catching on. For this reason, our Attends diapers are made in child sizes to help add a little extra protection to the children in your life. Caring for a loved one that has incontinence can be a tiring process. It is hard for them to ask for help and the adult diapers can give you both a needed break as they can learn how to change them out. Even if they are unable to do this, you can prevent the embarrassment with Attends diapers that have Velcro sides to help in removing the diaper easily.